I work in television, mostly on the coverage of Formula One Grand Prix. 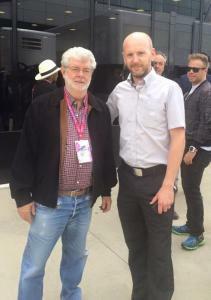 Occasionally I get to say “hi” to a celebrity, but in Silverstone this year I was fortunate enough to have a short exchange with one of my heroes, George Lucas. I told him what an inspiration he’d been to me. I genuinely wouldn’t be doing what I do unless I’d seen Star Wars a kid. I also told him that I’d made some films about movies myself. I didn’t go into any more detail for fear of sounding like an over excited fan (despite my cool exterior). “Oh that’s great” he said, and wished me a good race day. Then yesterday, one of my friends in the F1 circus said he had given George one of my business cards at Monza. Yes, George is a regular visitor to F1 events. My friends report of the encounter – “I know people probably do this all the time, but there’s this guy Jamie and he’s hugely talented and has done some amazing docs on the Original Trilogy and he’d be so honoured if you’d just check out his stuff. Here’s is his card”. Imagine what he’d have said if I paid him! “Ok cool, thanks so much” replied George. So Mr. Lucas, if you haven’t lost that business card and you’ve found your way to my site. Please check out the Full Videos section and take a look at what I’ve produced. Then if you have time, please pass this on to JJ, Kathleen and your old friend Steven. Thanks. It’s finally here! The Yoda Documentary!